The app also serves as gateway treatment for those who are not yet ready, or who are reluctant, to seek professional help. Today the UK’s leading eating disorder and body dysmorphia disorder outpatient service, The Recover Clinic, has launched the Recover & Me app on iOS and Android - bringing more than 15 years of clinical expertise to a wider audience. 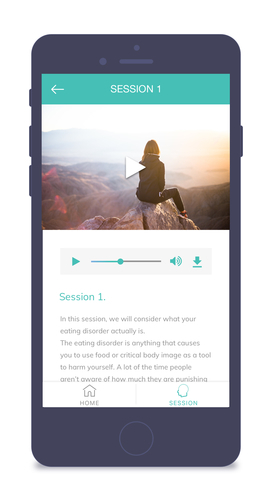 Emmy Gilmour, founder of The Recover Clinic and psychotherapist, built the resource to provide expert support for those suffering with eating disorders in an accessible medium, available 24/7 and in the palm of their hand. The Recover Clinic chose to create Recover & Me to address the growing number of eating disorder cases in the UK and to recognise the lack of treatment available to an increasing number of sufferers. The app also serves as gateway treatment for those who are not yet ready, or who are reluctant, to seek professional help. This may be because they are only just realising they may have an eating disorder or do not feel emotionally prepared to engage with face-to-face treatment. In contrast to some of the ‘tough love’ treatments that are often employed, this app aims to be more holistic by promoting self-love, compassion and confidence which are key to recovery from disordered eating. Each feature of the app has been developed to reflect the unique therapeutic techniques of The Recover Clinic, including 17 therapeutic video sessions with corresponding meditations and actions from Emmy herself. The app content recognises that recovery from eating disorders and female empowerment are intrinsically linked. The app provides a more holistic approach than other apps currently on the market by including a treatment plan made up of therapy videos, a meditation course, nurture log and journal. Grace Victory, an award-winning blogger, YouTuber and body image campaigner, is a current client of The Recover Clinic and is thrilled that the launch of Recover & Me will mean that more people get access to their expertise. Similar to the direct therapy sessions Emmy uses at the clinic, these videos focus on educating and empowering the user, so they can make decisions that nurture self-love and self-care on a daily basis throughout their journey. Each of the 17 sessions includes a video, audio player for corresponding meditation, a written explanation of the session, and an action for the user to complete (such a vision board, affirmations, or letter to their inner child). As many times a week as possible, users are encouraged to find a space to be peaceful for 15-30 mins. This is essential if they wish to become master of their thoughts, and take time to focus the mind on what they really want to achieve in their recovery. My Journal is a diary space that users can use every day to log their thoughts and feelings in their recovery. It’s a great way to stay mindful and provides an outlet for thoughts and feelings, and means sufferers are not so dependent upon their eating disorder as a coping mechanism. The app will be launched during Eating Disorders Awareness Week and will be free to download on iOS and Android with access to introductory content, full content can be accessed for as little as £8 per month or £60 for an annual subscription. The Recover Clinic is the UK’s leading eating disorders and body dysmorphia disorder outpatient clinic. Founded in 2007 by psychotherapist, Emmy Gilmour, the clinic was the realisation of a dream to create a holistic treatment model tailored to the ‘whole person’ – body, mind and spirit. Emmy Gilmour is a qualified psychotherapist with more than 15 years’ experience in trauma and mental illness. Throughout her career, Emmy has discovered remarkable patterns in the ways women are conditioned to respond to trauma and life-challenges. She's devoted her life to sharing her learnings with sufferers and has created an approach to the treatment of mental illness that aims to empower individuals and help them strive for holistic balance. Emmy has availability for email interviews. This press release was distributed by ResponseSource Press Release Wire on behalf of Propellernet in the following categories: Health, Women's Interest & Beauty, Medical & Pharmaceutical, for more information visit https://pressreleasewire.responsesource.com/about.